Barre Fit incorporates elements of dance, ballet, Pilates and workout moves to create an adrenaline-fueled workout that strengthens, lengthens and chisels the body. Each class features energetic combination of movements that enhance flexibility, improve balance, and challenge the core as well as muscles of the whole body. No prior experience is required. Just be ready to sweat! Pilates was started by a man! Core strength, flexibility, balance and efficient movement patterns — all are hallmarks of Pilates training and highly relevant to men’s and women’s fitness. 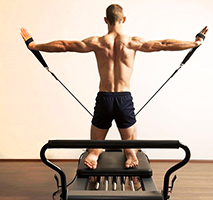 The integrative component of Pilates can be especially beneficial for men, whose workouts often emphasize a part-by-part approach to muscular development, such as occurs in weightlifting. It speaks for itself that women are most welcome as well! Try it! In the Reformergroup we work with max 4 students. 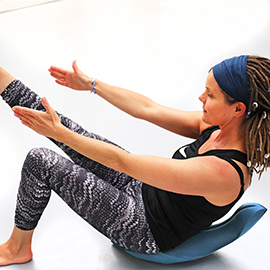 Do you want to feel what “finding Pilates core” is really about? Would like to become conscious of all the small muscles that are so important for your spine and posture? Are you looking for feeling aligned and balanced? Training with the OOV will defintely support you in this! This specialized piece of equipment is developed by an Australian Ostheopaat Daniel Vladeta. After completing his BS in anatomy and physiology, Daniel continued his post-graduate studies in neuroscience, molecular biology and osteopathy. In 2008 he began to design and develop the OOV, a device with an unstable base to be used for rehabilitation and functional activities. Looking forward to seeing you at Studio Anna Mora! Sign in at Studio Schedule. New to Reformer? Try 2 classes for € 42!